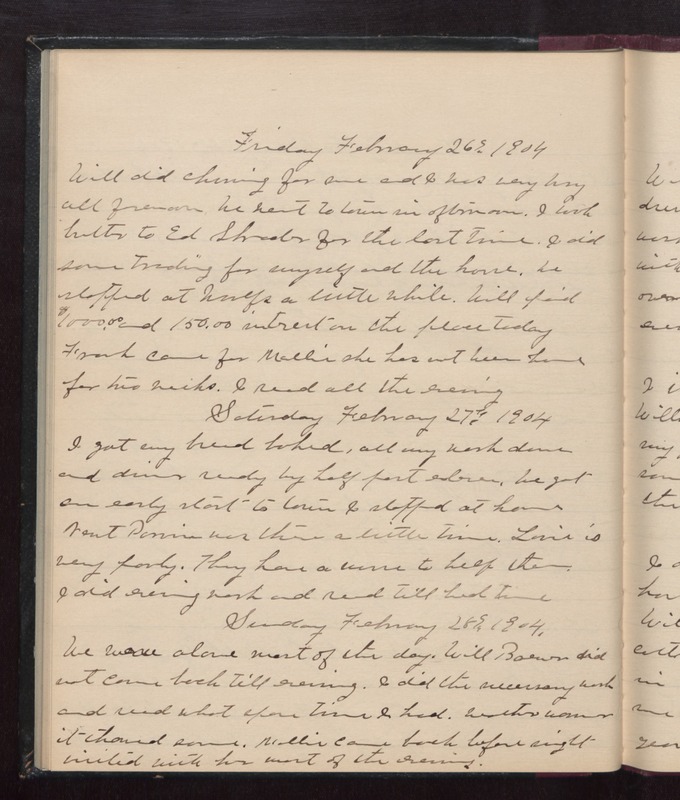 Friday February 26th 1904 Will did churning for me and I was very busy all forenoon. We went to town in afternoon. I took butter to Ed Shrader for the last time. I did some trading for myself and the house. We stopped at Woolfs a little while. Will paid $1000.00 and $150.00 interest on the place today. Frank came for Mollie she has not been home for two weeks. I read all the evening. Saturday February 27th 1904 I got my bread baked, all my work down, and dinner ready by half past eleven. We got an early start to town I stopped at home. Newt Purvin was there a little time. Levi is very [porly?]. They have a man to help them. I did evening work and read till bed time. Sunday February 28th 1904 We were alone most of the day. Will Brewer did not come back till evening. I did the necessary work and read what spare time I had. weather warmer it thawed some. Mollie came back before night. visited with her most of the evening.